INDICATIONS: A water-soluble cream for the treatment of dry skin. 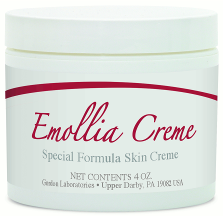 DESCRIPTION: Emollia Creme is a special formula skin cream designed to soften and moisturize dry skin. Its lubricating oils, solvents, emulsifiers, natural and cleansing ingredients combine for a soft rich consistency. This pleasant scented, pink cream is suitable for spreading over large areas, and can even be used as a non-soap cleansing agent. Emollia Creme is water-soluble, so it is less oily, and can absorb well into the skin. It is well-suited for revitalizing hands and feet, and for keeping the skin healthier looking. CONTRAINDICATIONS/ WARNINGS: For external use only. Keep out of reach of children. DIRECTIONS: Massage into skin once or twice daily or as prescribed by a Physician.